Bokaria Wirenetting Industries is a universally recognised and leading manufacturer and supplier of a wide range of meshes and wires and its allied products of superior quality to its clients across the globe. 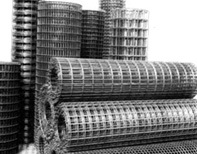 Established in 1957-58, our products are Weld Mesh, Welded Wire Fabric, Barbed Wires, Perforated Sheets, Chain Link Fencing, Expanded Metal Mesh, Hexagonal Wirenetting, Concertina Fencing, Vibrating Screens and Metallic Conveyor Belts. They are made using the best of raw materials available in the industry to ensure better and superior quality of the products. Over the years, we have evolved much in terms of the quality of our products and have also been addressing the needs and requirements of our clients through these unmatched service and quality products. With over 5 decades of experience behind us, we have overcome many of our competitors and today, we are a universally recognised as leaders in the manufacturing of wiremesh,weldedmesh and its allied products. We are also recognised for our full customised service support and also our quality products. #12, Vepery High Road, Periamet, Chennai - 600 003. INDIA. © 2014 Bokaria Wirenetting Industries. All rights reserved.